Bike riding across San Francisco’s Golden Gate Bridge is quite a high and one of the coolest things I have done in the US. One of the most iconic landmarks in the United States, it was pretty intense and exhilarating. It’s a wild, fast ride across the 2 mile bridge, and so worth the day it takes to do it. With various tour operators offering bike riding across the Golden Gate Bridge, it is easy to get outfitted. We (husband, 14 year old step daughter, and me) chose Blazing Saddles, a play on the title of the 1974 Western spoof movie by the same name, because it was the first one we saw when our taxi dropped us off at Fisherman’s Wharf (Bike & Roll is another good company to use). The college-aged employees mostly hailed from Ireland, in the US for school and summer jobs. They talked fast, showed us the map, and got us on our “Deluxe Comfort Mountain/Hybrid” bikes which they suggested as the best bike for the bridge crossing. The tour company offered ten different bikes total, even tandem bikes. We felt like San Franciscan’s as we headed out from Fisherman’s Wharf and passed beach-goers, runners, joggers and bikers, locals walking their dogs, lots of BBQ’s and picnics (a two-year old’s birthday party at one of them), and local pickup games of football and soccer at Crissy Field. A velocity of people, all mixed in enjoying the outdoors - that’s California. The temperature was no higher than 63 degrees that day; even the locals admitted it was unusually cold for being summer. 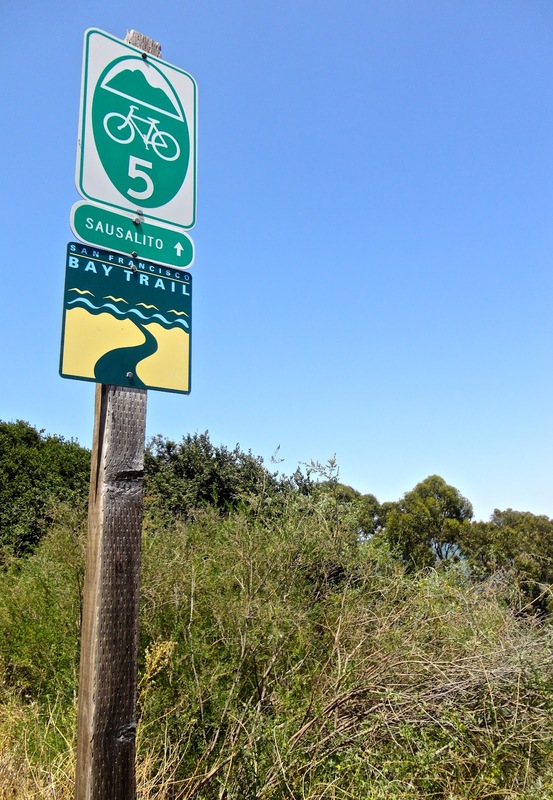 The bike ride was relatively easy up to the bridge, with different points along the way to stop for photo ops. In particular, at the National Park Service’s “Warming Hut”, which was perfect timing, and a needed respite to grab that last cup of joe before heading up the winding hill to the entrance on the west side for the bike crossing. Only in California, the hot dog stand next to the Warming Hut sold “No Antibiotic, No Hormones” hot dogs, touting it’s “free range” status. Once we started on the bridge, it was an impressive site to see the support pillars reaching upwards into the fog, the stark color contrast of rust and grey. The massive size is daunting, and everyone stops to take pictures at the base of the pillars, steeling themselves against the wind. The Bay below was a swirl of celadon colored energy with white caps, with cliffs of black boulders on each side. Suspended high above San Francisco Bay at 220 feet (67 m), the water looked beautiful, but nonetheless menacing. And I am not even afraid of heights. I wonder how people climb the cables of the pillars and not be blown away? The constant buffeting of the wind and the roar of eight lanes of constant car, tour bus and truck traffic was deafening. (which is a pretty big challenge for little kids considering the height, total distance, stiff winds, voluminous pedestrian traffic crossing the bridge in both directions). When we stopped to take pictures, the wind would about blow us and our cameras away - it was tough to hear and even tougher to smile with what felt like a million little cold needles pounding our faces. Perpetual mist driven into every pore by the wind. Many tourists had little kids with them biking across the bridge - a quick way to see what a kid is made of. 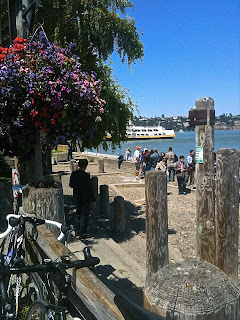 On the Sausalito side, we had every intention of seeing the “tallest trees in the world”, the California Redwoods, at the Muir Woods National Monument, (9 miles from Sausalito), and then on to the cute town of Tiburon, catching the ferry back long before the last one departed at 8:00 pm. The only way to accomplish such a ambitious 1-day journey would have been to start when the bike rentals opened at 8:00 am. Hit up a grocery store, pack some snacks, water, wine, and lunch and really enjoy the ride as an all day adventure, and pack it all in, all the way to Tiburon. 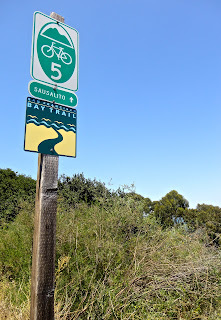 We realized this about 4:00 pm, when we were just getting something to eat in Sausalito at the swank Italian trattoria Poggio, and hadn’t even begun to see anything beyond the town. We headed back on the 7:00 pm ferry. Such an iconic landmark; now I will be forever looking at the Golden Gate Bridge differently, knowing how biting the wind is in August, how cold the mist that pounded my face, how stable the suspension bridge is in the perpetual wind, and how insanely high it is above the white caps below. 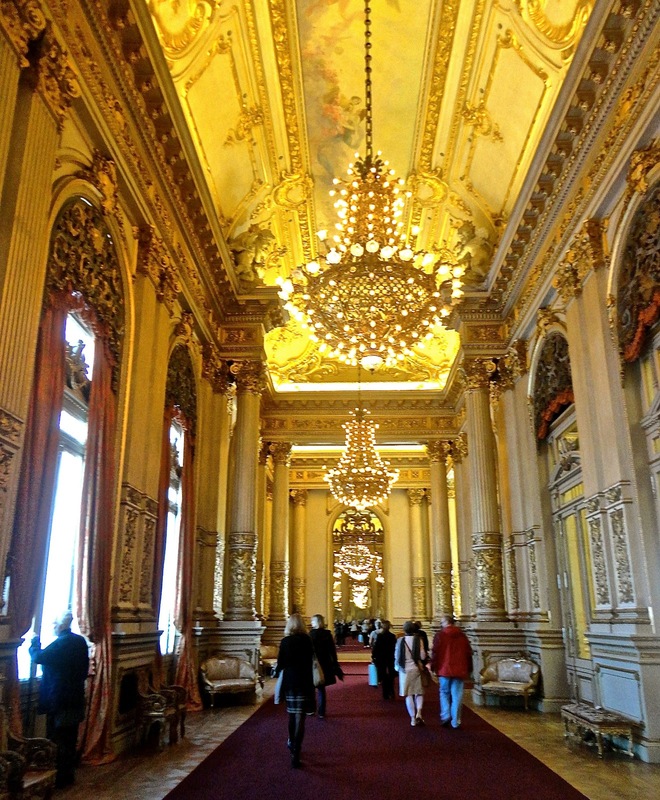 The Teatro Colón in Buenos Aires, Argentina, built in 1910, is world renowned, and has showcased the stars of the opera world over the course of it’s history: Placido Domingo, Beverly Sills, Maria Callas – and more. 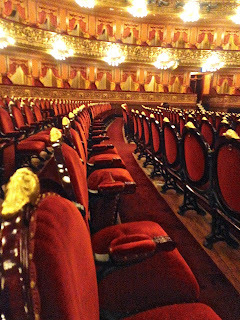 All have all performed at the legendary Teatro Colón. Coming off of a 10 year, $100 million (USD) renovation, which saw the Opera house shuttered completely for four years from 2006-2010, the century old Opera House shines its brilliance once again. After a false start a couple of months ago when I tried to take the tour ($110 pesos/$25 USD), and was told the stage would not be seen on the tour due to a performance taking place that afternoon, I deferred my tour until my next trip to Buenos Aires. 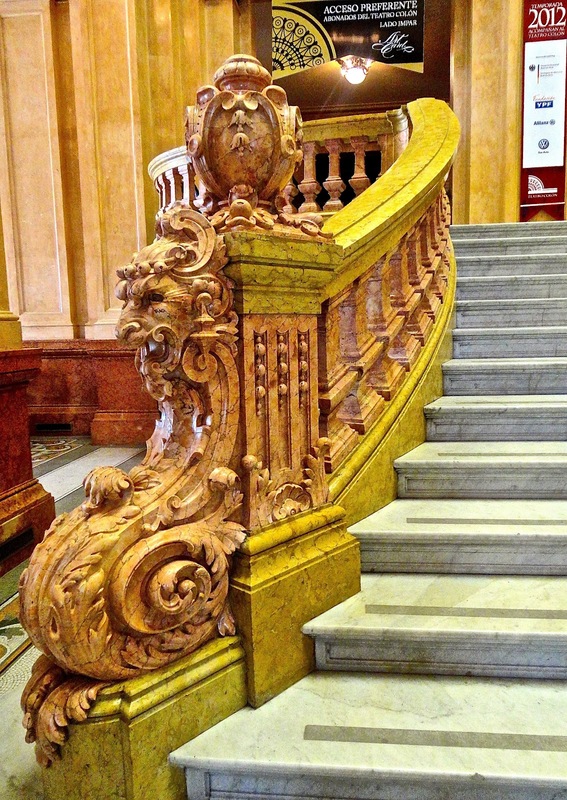 After such extensive renovations, done in three stages, I wanted to get the full tour. 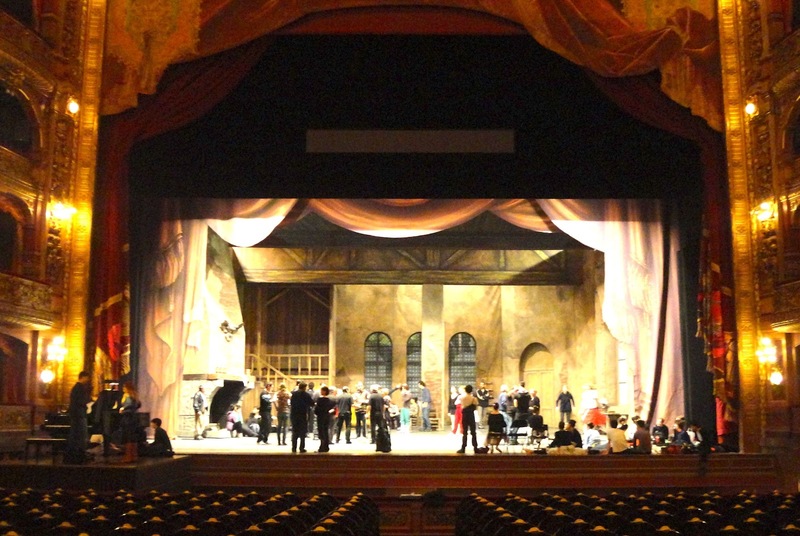 The acoustically perfect performance stage had been overhauled to pitch perfection; I did not want to miss this vital part of the renovations, and heart of the opera house. Our group’s tour guide, Carla, was informative and engaging. Standing in the intermission hallway, under busts of Mozart, Bellini, Bizet, Beethoven, she burst into operatic stiletto, smiling wirily at our surprise. (She is a student at the School of Opera, and all tour leaders attend the school). 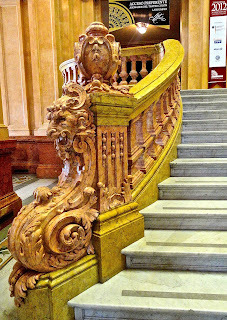 Carla exhibited a cultural pride that floated on her words of the history and romance that is part of the Teatro Colón opera house. Underneath the four busts is the sinewy marble statue, “The Secret”. 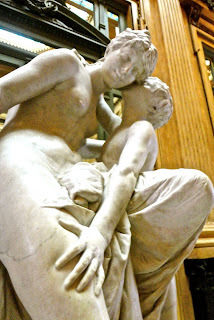 Two fingers of Venus were broken off somewhere along the way in the transport to Argentina from Italy (where the exquisite statue was carved on commission), and having been shaped from one single piece of marble, consequently the broken fingers were not to be replaced So fine is the attention to detail, Cupid’s hand shows a soft, indented impression on his mother’s thigh, as he leans up to whisper in her ear. Cupid is telling his mother a secret: whose heart he is going to shoot his bow of love through during intermission, as elegantly dressed men and women stand nearby, sipping champagne. Four different marbles, ranging in colors from gold to copper to rust to dark green, resonate throughout the interiors. The Gold Hall, painted in 18K and 24 K gold, also used during intermission, hosts chamber concerts, and was modeled after the interior of Versailles’s Hall of Mirrors, embellished with furnishings from Paris. Students who are to perform for the first time on stage must first present themselves in concert in The Gold Hall. 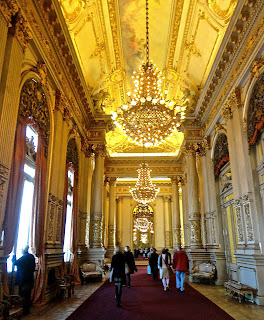 Again the pride from our tour guide as she swished back the red velvet curtains to the entrance for the concert hall. Sultry Argentine beauty, red velvet saturation, turn of the 19th century, Dr. Zhivago, all rolled into one as we walked in to sit in the patrons chairs. Concert boxes for the President and Mayor of Argentina, and Buenos Aires, respectively, were opposite us. The VIP box at mezzanine level where we were gathered, and which is sold to ticket holders (the public) for $1500 pesos, is identified with the Coat of Arms of Argentina at the front. Our lucky day as a ballet performance was rehearsing. The influence of Milan’s La Scala and Paris’s Opera House is evident throughout, yet Teatro Colón shines as its own beauty, especially at night, reveling in its status as one of the top five opera houses in the world. 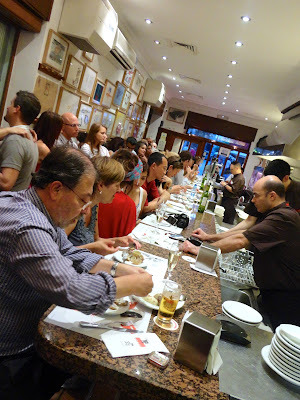 Dubious is an understatement when it comes to how I feel about going to a restaurant that is “outed” - Michelin stars, guidebooks and New York Times write-ups - since the quality decreases, prices increase and it is overrun with tourists. That was my thought bubble exactly the night three crew members (Diane, Debbie and Dee) and I went to Cal Pep for dinner in Barcelona. The week prior, Debbie had gone to Cal Pep, and loved it so much, she insisted we go this trip. I was going to hold her feet to the fire over this one, especially since we had to queue up at least one hour ahead of the restaurant opening to be sure we were in on the first round of seating at the tiny counter where all the major action happens. Those in first were able to sit at the bar and be entertained by the perpetual motion and activity of Mr. Pep himself. 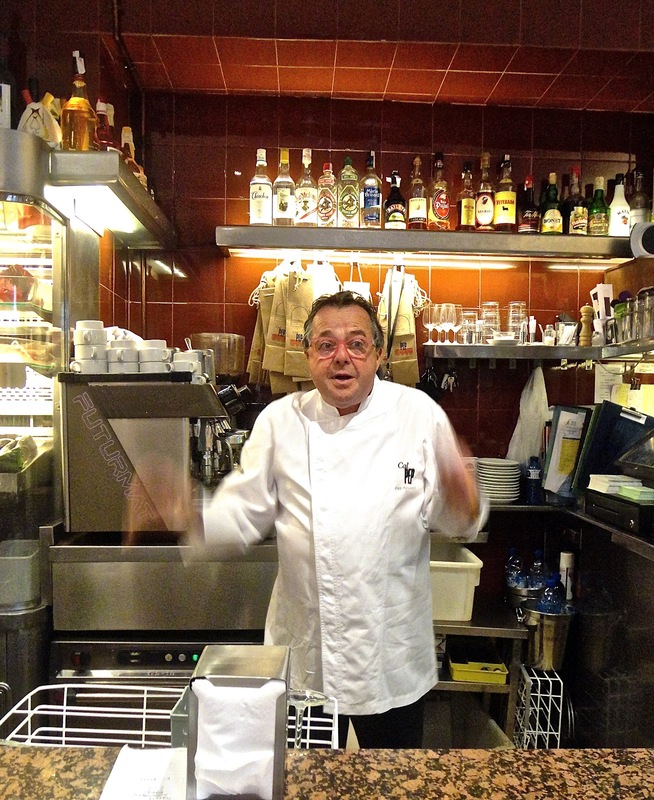 The best way to describe chef Pep is to see his caricature on the restaurant’s website in the likeness of the Greek god Poseidon, chef Pep wearing his trademark eye glasses and a crown, wildly riding crustaceans for his chariot through the waves, a trident speared with an olive, of course. Even the restaurant’s business card is Cal Pep in his trademark eye glasses and chef’s jacket hoisting platters of fish above a scene of The Last Supper with Jesus and his twelve faithful disciples. The caricature drawings line the wall where patrons wait for open seats at the counter, the glass door on the side of the tiny restaurant, and even the brown paper bags that rest over the top of the wine bottles seated at the tables in the back room. We were too far back in the line to get a table at the counter and were offered seating in the back room. 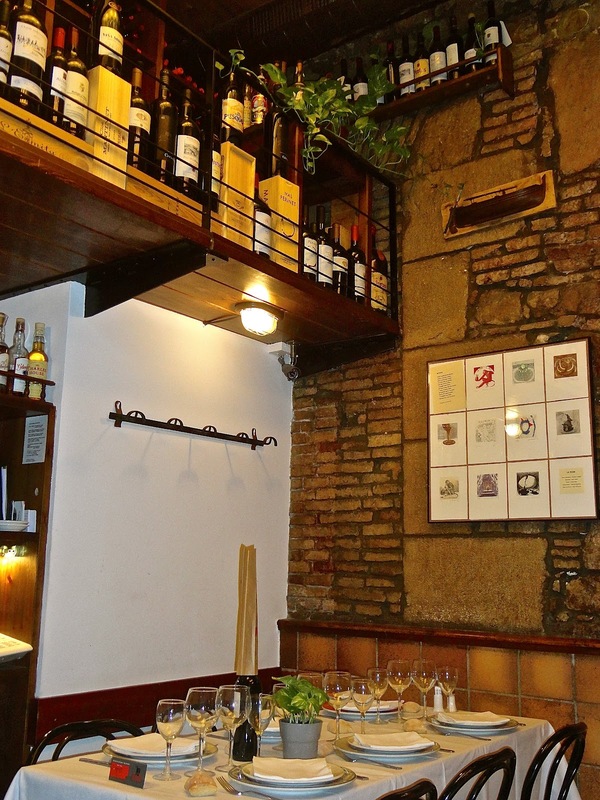 This room was the intimate and romantic dining room with walls of wine racks up to the ceiling stuffed full of red wines, exposed brick walls, and a ship’s galley door separating the rooms. We were all alone, eating too early for the Spaniards who avoid the counter. We were told by our waiter who spoke minimal English we would each pay 25€. Then came the tapas: a total of eight in all. Certain choices on the menu change daily depending on the daily catch. First up for us though was a round of cold, locally brewed Estrella Damm beers. Our waiter started us with some of the restaurant standards: pa de coca (the equivalent of Italian bruschetta) and truita trempera (Spanish omelette), which was so fresh the eggs didn’t dominate the taste the way it is often is the case in sub-par tapas restaurants. The xpirons amb cigrons (baby squids with chickpeas) came in a black cast iron pan that enhanced the smoky, deep flavor (just like the regional foods of my hometown in south Louisiana such as gumbo and cornbread). Next came calamar fregit (fried calamari), which were fried with a very light touch, and cloises amb perni (clams with ham). The carxofes (artichokes) were simply delectable, not the least bit salty or mushy. With this amount of seafood there is always the danger being over salted to a point of ruination which is quite the contrary at Cal Pep. 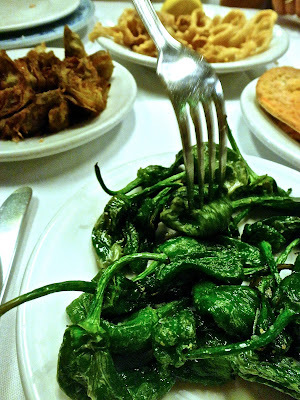 The one food that we fought over the most for the last bite was the pebrots del padró (Padron peppers), lightly sautéed in olive oil with a smidgeon of salt. Retaining their bright green color, these small, green peppers burst with flavor, not heat, and are worth returning for! I am going back to Cal Pep, and I plan to be out there waiting with the tourists to get a seat at the counter to watch Cal Pep himself in action. 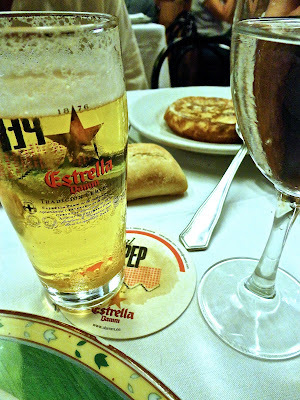 And this time, I want to order dessert with a cup of café con leche, as surely the desserts are as savory as the tapas. A perfect ending to dishes that surprisingly stand up to the glowing write-ups. 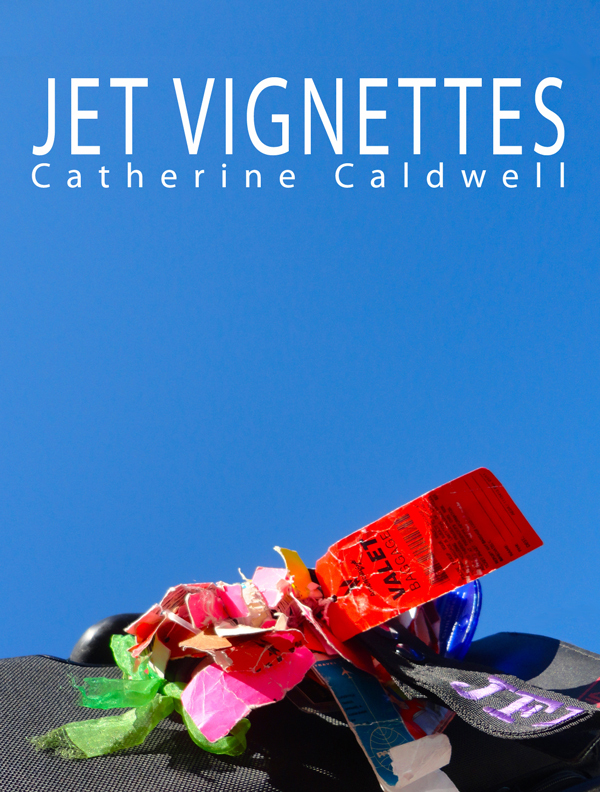 "Jet Vignettes; A Recommended Book for Every Airline Passenger"
Europe, South America, North America and Asia - this is where I travel mostly, and do so often since I am an international flight attendant for a commercial airline, and married to a man who is European. Since it is what I do, it’s what I write about, noting along the way new discoveries of food, drinks, shopping, places to see, cool things to do. Love seeing the world, and seeing what’s out there new to discover. And I love to photograph it all too.